Spice up your invitations by adding character and some pizzaz! Once upon a time (and it wasn't all that long ago) invitations for events were expected to all look basically the same. They were on white or light cream paper with scrolling, looping lettering in a relatively simple envelope. They were elegant, but boring. No longer! In this day and age, people have begun using much more modern invitations. Gone are the days of elegantly boring cards. Today, anything goes. If the invitation is for a wedding, white is still appropriate, or possibly a nice mix of white and black. The invitations can also be chosen to match the bridesmaids' dresses. There are versions that look like lace or even use real lace. The options are nearly endless. For a new year's day party however, do you really want that same old looping script that's used on a plain white card? Why not get an invitation with balloons and streamers, or with a wine bottle and glasses? How about one with father time or the New Year's baby on it? The point is, your invitation should match the event and the mood of the party you're throwing. If you really want to be unique, you can completely design your own invites. This can be as simple as designing the graphics and sending the cards to a low-cost digital print service to print. Gone are the days when you had to have 500 copies of something because of the plate charges. In this era of digital printing, there are plenty of places that can copy 100, 25, even 10 cards for you without being cost-prohibitive. 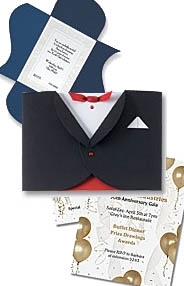 If you really want to stand out, you can create your invitations and/or envelopes from scratch, like the awesome tuxedo invite shown in the center of the photo above. There are places where you can purchase all of the paper supplies you need to make these completely unique, memorable invitations. Whether you make them yourself or allow a company to do it for you though, modern invitations need to have character. Make sure your choice reveals something about you and the spirit of the event you're throwing.